Help! It’s Supposed to Rain on Our Wedding Day! - RiverCrest Weddings - Montgomery County, Chester County & Philadelphia's premier wedding venue. You can control many aspects of your wedding day, but the one factor that’s always unpredictable is the weather. While some couples consult the Farmer’s Almanac like it’s the Bible, others simply pick a date and pray for a sunny day. 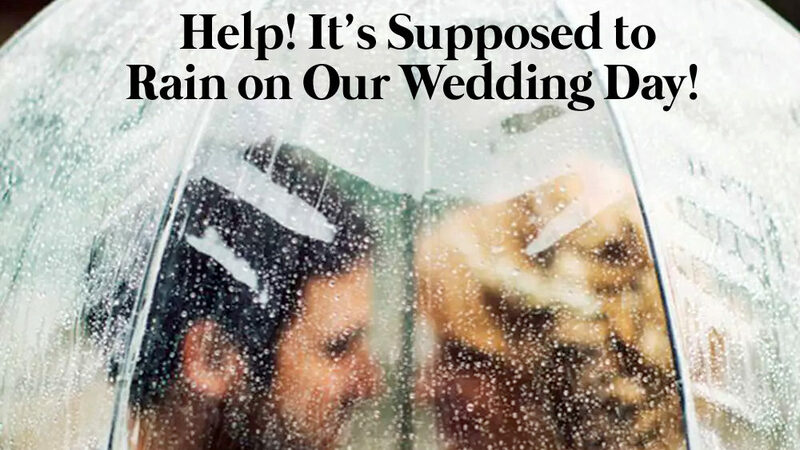 But a soggy wedding-day forecast doesn’t have to spell disaster. With a bit of planning (and an open mind!) you can keep your wedding vision intact — and keep dry. First things first: Don’t obsess about the forecast too far in advance. You’ll drive yourself crazy, and you have plenty of other wedding tasks to tackle. But if you’re planning to get married in a typically rainy season (fun fact: July is the wettest month of the year! ), you’ll want to plan ahead. This means having a backup plan for outdoor weddings. Find out if your venue has an alternative ceremony or reception space in case of inclement weather*. 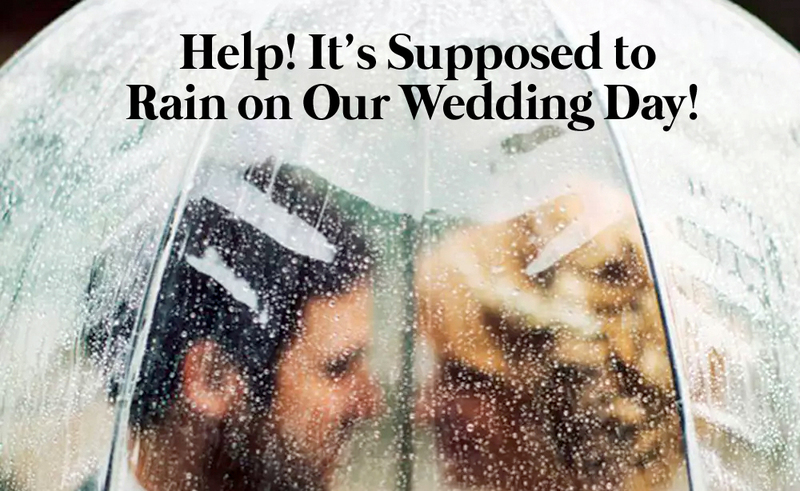 If you’re having an outdoor ceremony in a particularly rainy month (see above), be prepared. Stock up on inexpensive umbrellas and place them in a container at the entrance to your ceremony so guests can keep dry. Check this out for inspiration! And definitely invest in attractive umbrellas for your wedding party, so you can still get a few wedding photos outside. (Clear bubble umbrellas are a popular option.) See these wedding-day photos for even more ideas of how to embrace a drizzly day. And finally: Embrace it! You can’t change the weather, but you can change your attitude about it. A rainy day can make your wedding feel even more warm and intimate, and it provides some terrific photo opportunities. Plus, a cloudy day makes for even better photos, as the light is softer and more flattering. So forget the forecast and remember the bright side: You’re getting married, and even a bit of rain can’t stop that. * Here at RiverCrest, we have gorgeous outdoor options for ceremonies, but in case of a rainy wedding day, we can easily move the ceremony indoors to our Roberts Room, where plenty of huge windows let in light while keeping out the elements. Or plan on having your ceremony in our covered Patio Terrace, which seats up to 200 guests and gives you the outdoor feel, no matter what the forecast has in store.